Malaysia-backed Perdana ParkCity has applied the concept of its Desa ParkCity to a new development in Hanoi. 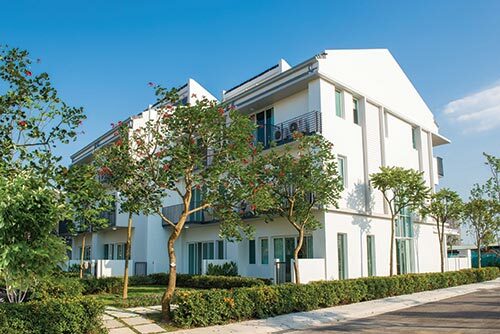 Lawrence Peh – CEO of project developer Vietnam International Township Development JSC – said that protecting the environment remained everybody’s responsibility. “Things we can do as individuals range from simple daily habits like not wasting water and energy to supporting green and environmentally-friendly products and services,” said Peh. “We believe having homes located within a natural setting is an important step for occupants to experience greater awareness and appreciation for the environment. With Hanoi’s rapid urbanisation, having the opportunity to own a home within a uniquely designed environment such as that found in ParkCity Hanoi will remain an extremely attractive selling point,” he added. ParkCity provides all the open space and calm that can be found in an out-of-town resort get-away, thanks to its open space, lush greenery, recreational facilities, meandering pathways and quiet streets. The development also includes facilities including swimming pools, gym, tennis court, badminton and basketball courts, BBQ garden, multi-purpose hall, café and pavilion, which give ParkCity residents the feeling of living in a resort. ParkCity’s phase 1 named Nadyne Gardens boasts an amazingly-low construction density rate of just 38 per cent, with large amounts of the grounds devoted to greenery and public utilities, while each house boasts a private 15-metre garden. ParkCity also provides an inner linear park that runs through the neighbourhood. This main park also provides communal places for friendships and communities to flourish. Besides this park, what makes ParkCity’s townhouses and semi-detached villas special is their living rooms look out onto landscaped linear parks between rows of houses instead of a garage. ParkCity’s construction also entertains eco-friendly and energy saving design with double frontages that allow for cross ventilation and maximise natural light. Other features include a light roof system with concrete tiles which reduce heat during the summer, double cavity walls that minimise noise and provide insulation and an intelligent sewage treatment system. ParkCity also offers a 6.7 metre-wide inner road system and tree-lined public walkways throughout the community. Located across 77 hectares, ParkCity Hanoi Town when completed will offer 7,000 houses and a shopping centre, with full supporting facilities, modern amenities and public facilities. The first completed townhouses will be handed over to customers in the last quarter of this year. Apart from the first phase, the second phase ParkCity Hanoi Town Centre is also taking shape. Located at the 18.3 hectare urban core in ParkCity, the centre will combine residential, retail, and commercial spaces into a high amenity pedestrian-focused urban district. It uses an innovative approach to mixed-use buildings that combine retail streets with aforementioned offices and housing. Parks and public plazas have been introduced into the tight knit urban fabric to create a unique urban experience. The goal was to create a regional destination that would become the high value shopping district for West Hanoi. The overall development includes nearly 40,000 square metres of retail, 117,000 square metres of mixed-use property and 145,000 square metres of residential area complemented by medical, recreation, and entertainment facilities.